Arsenal manager Unai Emery has confirmed a fresh injury blow for the Gunners with Hector Bellerin likely to be unavailable for the festive round of fixtures. The Spain international sustained a minor leg injury during the first half of the Gunners' 3-2 league defeat at Southampton and he was thereafter replaced at the interval. 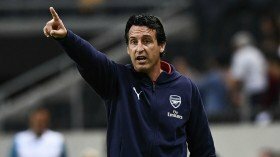 In a report covered by Sky Sports, Emery has now revealed that the right-back would be sidelined for 'some weeks' thereby leaving a potential void for the likes of Maitland-Niles and Stephan Lichtsteiner to fill. The Gunners have been hampered by injuries over the past month and it had already been confirmed that Rob Holding and Danny Welbeck would miss the remainder of the campaign. Still, the club have managed to overcome the various hurdles presented to them and the recent defeat at Southampton was their first after 23 matches across all competitions. Arsenal are scheduled to face Tottenham Hotspur in the League Cup quarter-final on Wednesday night. The Gunners recently beat their cross-town rivals by a 4-2 scoreline in the Premier League.